Hare or rabbit To the casual observer, a hare is often assumed to be a wild rabbit. But hares and rabbits are different in many ways. While of similar appearance, hares are larger, and have longer ears and hind legs than rabbits. Infant hares (leveret) are born with fir and open eyes; infant rabbits (kit or bunny) are born without fir and blind. Rabbits hide in either burrows or depressions in the ground during daylight hours and try to keep hidden; hares hide among plants and usually try to escape enemies by running. 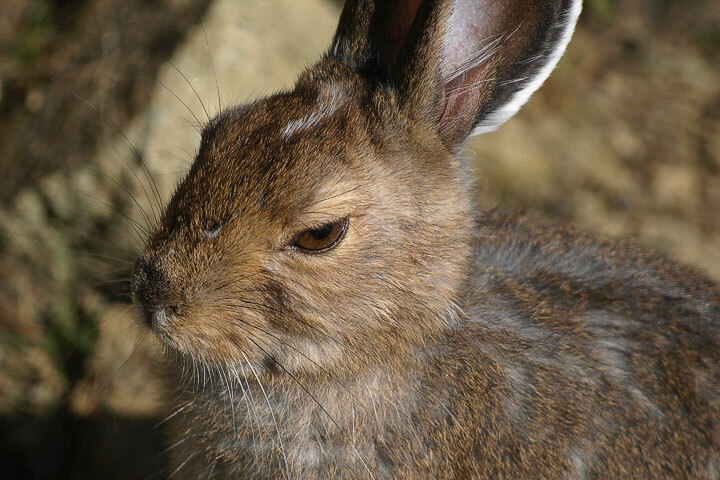 Rabbits live communally, and the males often fight; hares are solitary animals and don’t fight. Hares, rabbits and pikas all belong to the same order: lagomorph (they aren’t rodents). 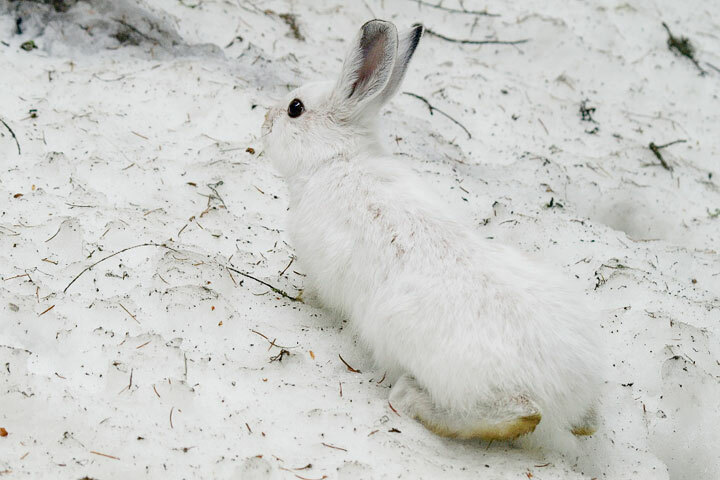 However, there are no wild rabbits found locally, and of the various species of the other two, only the snowshoe hare and the american pika are found in the vicinity of the Lake. The hare is a timid animal which forages on grass and forbs in the summer and twigs and willow and alder bark in the winter. 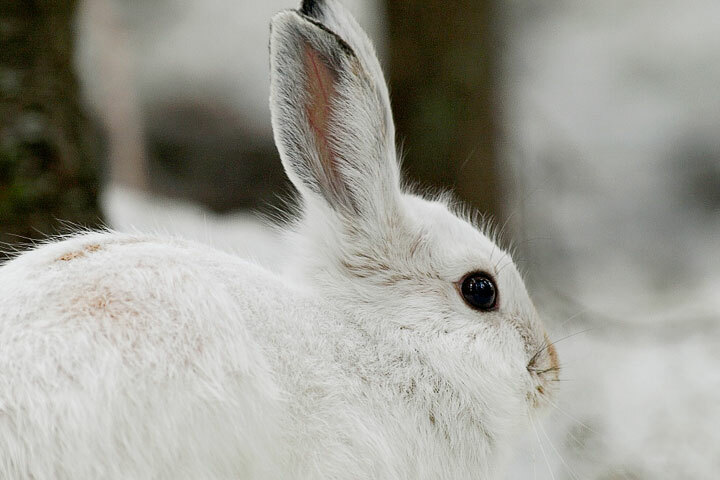 The snowshoe hare has two coats: rusty brown for summer; white for winter. It molts from one to the other in response to the length of the day. 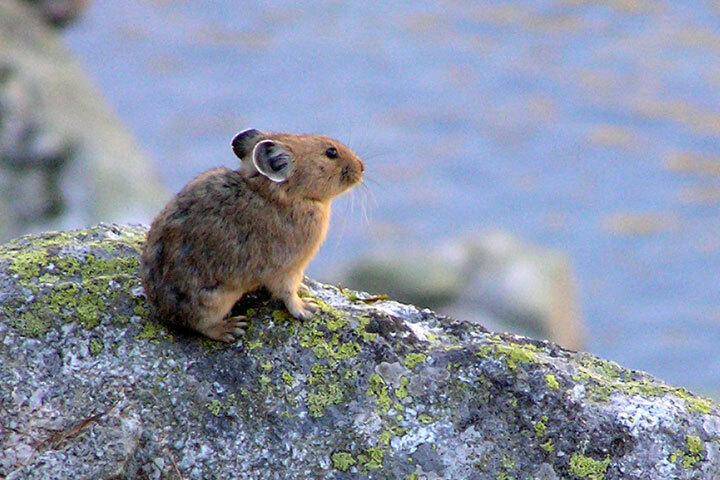 The pika, a relative of the hare, makes its home in the scree slopes at high altitudes around the Lake. From there it forages for vegetation in adjacent fields. The name, pee-ka, seems to mimic the bleeps it makes upon spotting something unusual in its surroundings. 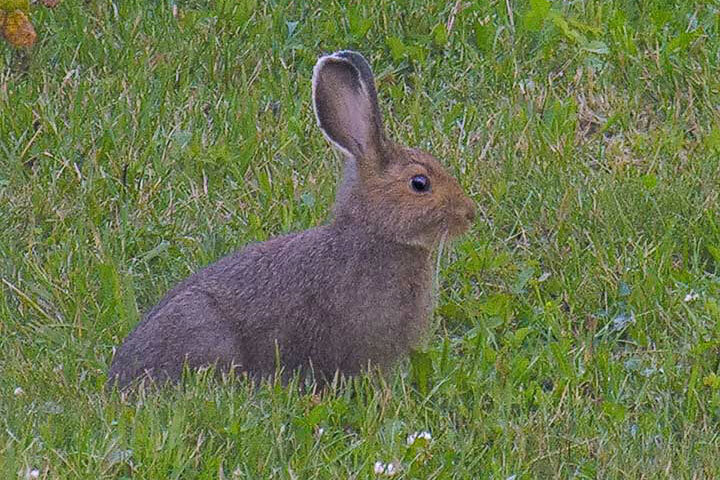 This Snowshoe Hare was foraging for grass in the early evening. 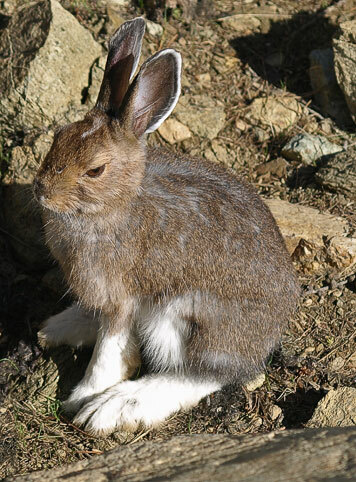 This Snowshoe Hare is named for its enormous feet which help it bound over snow in the winter. The American Pika, found around the Lake at fairly high altitudes, is the epitome of cute. 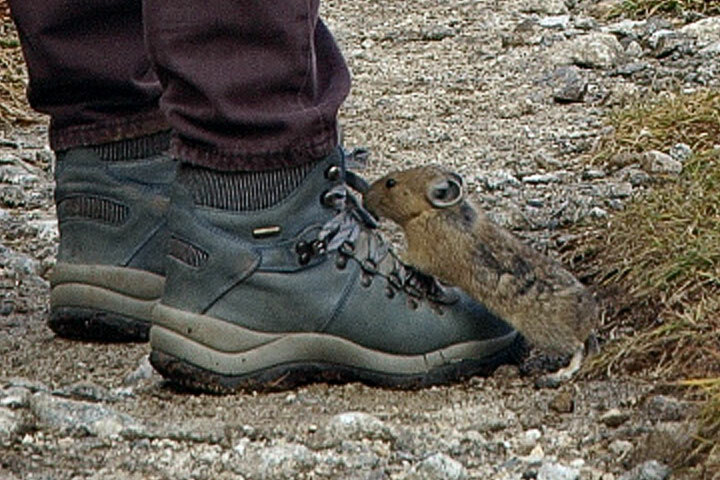 Pikas discovered something long known to marmots: cute sells. 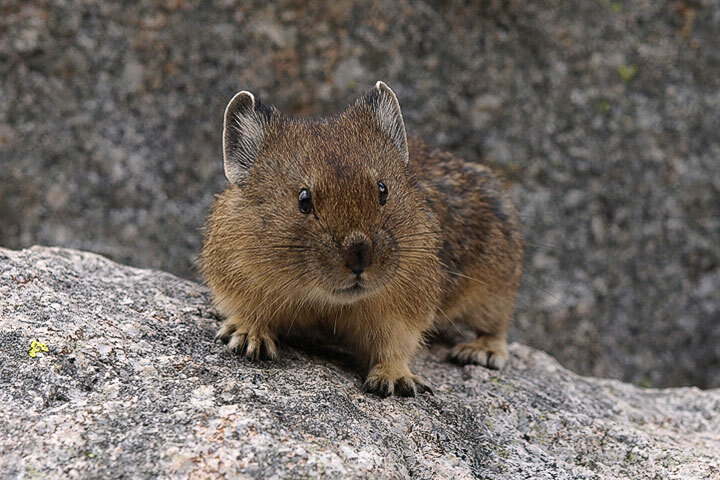 This pika is seeking titbits from hikers.